Joining other league of other video streaming services, Google has finally added High Dynamic Range (HDR) support to its Play Movies & TV service. With HDR support, videos become richer in colour and contrast. This addition would mean a lot more for the users who have a 4K Ultra HD TVs at home. The tech giant announced the feature enhancement in a blog post, earlier this morning. 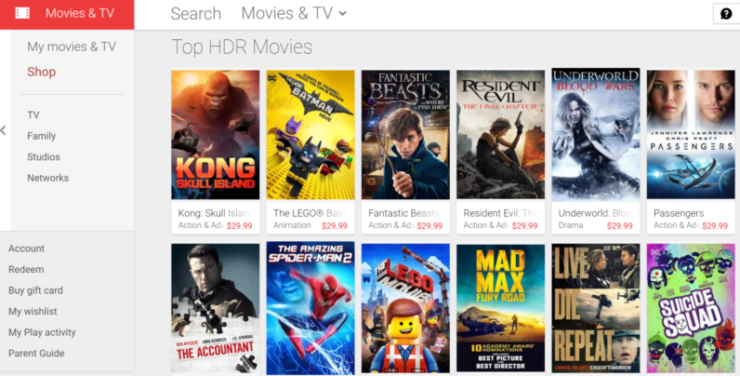 In the post, Google said that it the HDR support on Play Movies & TV will initially roll out to the United States and Canada, where it will be accessible on all Google-connected devices that come with HDR support. It also includes TVs with built-in Google Cast and also the select models from the manufacturers like Vizio, Sony, Toshiba, Philips, and others. It was about time that Google added this feature to its Play Movies & TV service. To recall, the company’s 4K Ultra HD streaming device – Chromecast Ultra has been supporting the two HDR formats – HDR10 and Dolby Vision since its inception, last year. However, unlike Chromecast Ultra, Google has not made it clear whether Play Movies & TV service would support both the HDR formats. Notably, by introducing HDR support on Play Movies & TV, Google is considerably adding HDR rich content to the service for renting and purchase by the users. With the addition of HDR content on Google’s video service, many users would be satisfied as they will now have their favourite movies and TV shows in better colour and contrast format. As we mentioned above, Google is a little late to the HDR content party as its counterparts like Amazon Prime Instant Video and Netflix had been supporting it for quite some time. Interestingly, Netflix is one step ahead of its rivals as it had recently added support for Dolby Atmos surround sound format as well. Regarding HDR content on Play Movies & TV, Google has collaborated with popular film studios like Sony and Warner Bros for announcing the release of movies like Fantastic Beasts and Where To Find Them, in the HDR format. It will soon be adding many other movies to the list of HDR content.